Baby Wants Candy is your one-stop call for improvisational musical comedy. 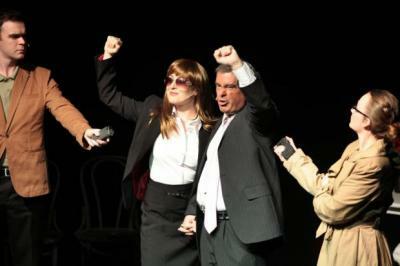 Each evening the five cast members perform a never-to-be-repeated original musical show, using a title suggested by a member of the audience. The lucky audience member whose suggestion is used gets a free t-shirt at the end of the show over-printed with the title of his show. It’s impressive to watch how one cast member picks up cues from the others and runs with it, often in a total tangent to what went on before. I get the impression that occasionally one member might playfully try to wrong-toot another. Sure it’s great crack. This kind of ‘spontaneous co-ordination’ must take a lot of practice to perfect. Aided by a wild bunch of frenetic musicians, this small team has put in a lot of hard work and are reaping dividends. They are playing to packed houses every night. Baby Wants Candy is just the ticket for anyone looking for a bit of light entertainment at this year’s Fringe. 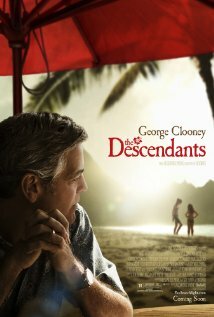 George Clooney plays the role of his life in Alexander Payne’s Oscar-nominated film, The Descendants. Everything is larger than life in this poignant movie, set in the Pacific island paradise ofHawaii. The haunting soundtrack exclusive features Hawaiian music. This music captures the mood and feel of the islands, especially the beautiful scenery. This will definitely boost the Hawaiian tourist trade. The film is a complex character study of how ordinary people deal with the family dilemmas that life often throws up in their faces. Even the most dysfunctional of families are often able to come together and help one another in their time of need. That’s the story of Matt King (George Clooney), a high-flying, workaholic lawyer who struggles to cope with his wayward daughters after his wife Elizabeth (Patricia Hastie) ends up in a coma in hospital. Elizabethwas injured in a speedboat accident and it seems that she is not likely to recover. Matt has no idea how to handle his mouthy ten-year-old daughter Scotty (Amara Miller) and his even more annoying foul-mouthed 17-year old Alexandra and her dozy boyfriend Sid (Nick Krause). The Descendants is an intimate film about the challenges of family life on ordinary people who are both suffering from and trying to overcome a painful loss. This bittersweet story weaves together moving drama and wry humour so deftly it is no wonder that it has received so many Academy Award nominations. This is a satisfying film that will move viewers to both laughs and tears with an ending that pulls off the impossible; it manages to be both sad and happy. It deserves to win every Oscar it’s down for. Clooney will have to work hard to better this one. After ‘granddad’ Milton bounds on to the stage in a strikingly loud shirt. He keeps up a steady stream of one-liners, enlivened with a few props from the shopping trolley and one of those large jotter pads on an easel you see at earnest meetings and seminars. Some of his lines falls into a pattern, so the audience can anticipate what’s coming and still enjoy it; ‘Not all horses are Trojan horses… I know that now… That was a messy afternoon’; later, ‘Not all pigs are piggy banks…’ and ‘Not all ducks are toilet ducks…’ It’s wonderful surreal stuff. Milton Jones is just the tonic you need after a stressful day.